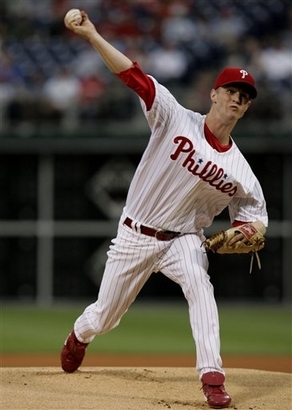 PBR - Kyle Kendrick enters Saturday's contest against the Rays hoping to snap a personal three-game slide. The right-hander has surrendered 16 earned runs on 20 hits over his last three starts. He's also walked nine and the opposition has a .304 batting average against. Kyle Kendrick (2-7, 5.29) starts Saturday. "I felt like I pitched a lot better than what my numbers showed," Kendrick said after his last start, a 6-2 loss in Toronto. "A couple mistakes they hit and didn't miss." Kendrick's peripheral numbers this season are intriguing. He's striking out more batters than he has in the past, yet he's also walking more. His BB/9 (3.29) and Opp. BA. (.292) are poor, yet his K/9 (5.71) is a career best. His swinging-strike-rate (7.8%) is nearly 3% higher than at any other time in his career. Considering the facts above, Kendrick's issue this season may simply be he's trying to be too fine with his pitches. He's getting more balls over the zone (see elevated strikeout rate), but he's leaving them in spots that hitters can reach (see batting average against). He may also be trying to nibble too much around the plate, hence the increase in walks. Going a step further, Kendrick has been in 27 full-count situations this year. Of those 27 occurrences, batters put the ball in play 14 times, walked 10 times, and struck out just three times (all on swinging strikes). NOTE: With last night's rainout the Phillies and Rays will play a doubleheader on Sunday, with the first game starting at 1:05 p.m. ET and the second at 6:35 p.m.